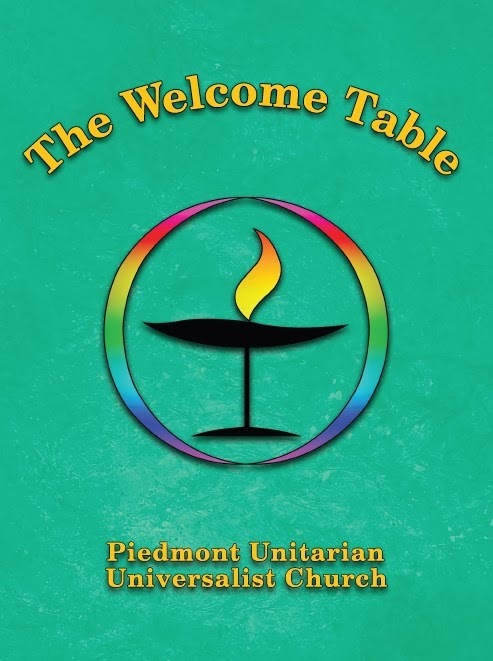 Piedmont Unitarian Universalist Church: The Cookbooks Are Coming! In January of 2013 the core cookbook committee, Mimi Davis, Merna Hesse, Helen Patil, and Claudia Perkinson met for breakfast to talk about putting together a first ever cookbook by members and friends of PUUC. After contacting the Morris Cookbook Company in Kearney, Nebraska for information, the committee began to collect recipes from the congregation. Countless people submitted recipes on forms provided by the company that adhered to a specific format, on scraps of paper, or from neatly typewritten collections. All the recipes were collected, divided into categories, transcribed, edited, and proofread by many additional volunteers. THE WELCOME TABLE was taking shape. A history of the Chalice was written, photographs taken on church property were chosen for the dividers, the cover design was decided upon, and finally, on October 4th, the contract for publication of 200 cookbooks was agreed to and the book submitted to the printer for preparation of a proof copy. The books will be available in late November or early December. Please join us at THE WELCOME TABLE. Containing almost 300 recipes, including appetizers, soups, salads, main dishes, deserts, breads and beverages, the book is a wonderful collection of favorites at $15.00 per book with proceeds after expenses to benefit PUUC. To reserve your copy or copies please contact Michelle Murphy, michelsea@carolina.rr.com or Val Whitfield, Valerie@ypblifecoaching.com. Please make your check payable to PUUC and put “Cookbook” on the memo line. The cookbook is also available as an e-book. Have you ever traveled with friends?